Contact John for Collectible Car Insurance, Diminished Value and Prior to Loss Insurance Claims, Fair Market Value and Pre-Purchase Inspections of vehicles located in the South Florida area. John has been a certifiable car nut since age 3 when he could name almost every car on the road in his native England. Things took a turn for the worse when he learned to drive at age 11 and turned a 1938 Morris 8 on its side during an off-road race. Severely bitten by the bug, John persuaded his parents to buy him a 1932 Austin Seven for £25 instead of a new bike, and restored it during high school. John and a pal built a 1953 VW Beetle into a Porsche powered rallycross car, and in 1971 won the RAC class championship. As the apple does not fall far from the tree, Brett started tinkering with cars in high-school and has since converted two LHD Subarus into RHD examples, with significant power increases. 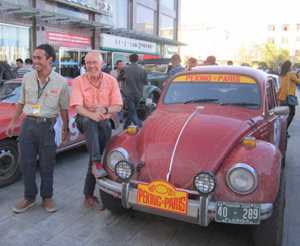 In 2012/3 Brett & John prepared a 1970 VW Beetle to participate in the world’s most grueling long distance driving event, the 2013 Peking to Paris Motor Endurance Rally. They finished 26th of 96 starters. If you are like John, no doubt you love your car and you’ll find they enjoy being around passionate car people and their cars. Regardless of whether it’s a classic, hot rod, exotic, resto-mod, or a frustrating accident claim, Brett or John will accurately appraise your vehicle. Cars are our passion, but we also appraise trucks, motorcycles, watercraft and airplanes!